It’s that time of year again, when clinics, pharmacies, urgent care shops — even supermarkets — exploit Americans’ health fears in order to make money and use fake medicine for promotion. Yes, we’re talking the Flu Shot Epidemic. 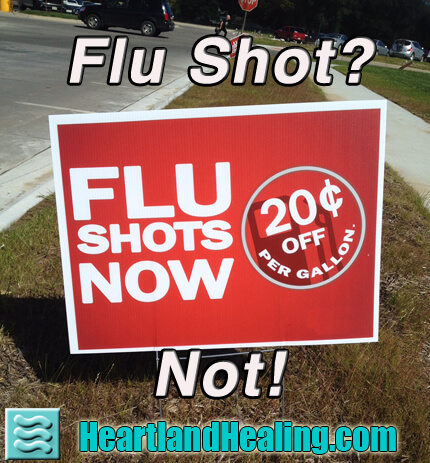 Everywhere you turn, there are signs urging you to get in line to offer your money and your body for a flu shot. Even at least one local farmers markets (embarrassingly) used Flu Fear and flu shots as a promotional gimmick. But some sources report that Americans are turning away from the hype about the hypo and rejecting the flu vaccine. Even though some companies and employers mandate it and on occasion co-worker peer pressure still coerces many, the general public is starting to see through the ruse and are dodging the jab. The best reason to be skeptical about the flu vaccine (and some others) is that there is no real science to support its effectiveness. And when some statistical analysis is done, the vaccine comes out on the short side of the numbers. Just feast your eyes on this reality. According to the Centers for Disease Control director Tom Freiden, last year’s flu vaccine was just 13 percent effective compared to the goal of around 50 to 60 percent effective. Let’s put that in thought-provoking context: Last flu season, the shot worked (supposedly) for about one out of ten people who received it — one out of ten! And the best case hoped-for scenario is for the vaccine to work about half the time. Look, would you get on an airplane if the pilot said it may fly one out of ten times? And at best, the optimum goal was for fifty-fifty? Come on. Autism Cause? Do vaccines like the flu shot cause autism? Jenny McCarthy’s protest aside, maybe yes, maybe no. The point is that we don’t know for sure. But that’s not the real reason to avoid a useless, invasive prick with a needle. The best reason is that you just don’t know how it’s going to affect you and injecting a foreign substance into your body is not a benign insult to you and your immune system. Under the guise of “science”, the drug companies parade out experts with medical degrees, titles and official positions to recommend that we offer up our arms for a poke. But apply some common sense here and some self-reliance. Do the research. Maybe I’m an oddity, but back in the day when I handled prescriptions and even — gasp — took some on doctors’ orders, I always read the drug inserts. I always looked up the drug in the Physician’s Desk Reference, the venerable PDR. That interest in the PDR goes way back. Heck, when we were raiding our parents’ medicine cabinets in high school, we wanted to know what drugs were the good ones. And finding out about the flu vaccine, reading the actual accompanying information sheet, will tell you that the vaccine is virtually untested. Add that to the aforementioned statement by the head of the CDC that last year’s was only 13 percent effective. Quality Control? Apply some more common sense and some of your own personal observation. Would you go to the hardware store, buy some one-inch nails, take them home, wipe them in alcohol to “sterilize” them and then stick one in your upper arm? Not likely. So why would you pay money for someone to stick a stainless steel version of one, along with a batch of chemicals you know nothing about and have been described by their biggest fan as next to worthless, into your body? Unless, that is, you have fallen for the hype. And certainly as a consumer you must have noticed that the products you’re buying nowadays aren’t nearly as reliable or of high quality as they once were. Whatever the reason — automation, profit-taking, outsourcing, — faulty products are standard. Everything from lettuce, to seat belts to entire automobiles by the millions, are recalled every day. And you think medical devices and drugs are monitored any better? No, this is just silly. Reality, not Hype. Just let the numbers do the talking from here. From 2004 to 2015, according to CDC numbers, the flu vaccine averaged only 38 percent effective. And that cited number is by way of some of the most faulty research standards ever imagined. Another number is that “36,000 die yearly from influenza,” the CDC proclaims. That number has been questioned and debunked time and again. The actual number is an average of less than 1000. Check it all out yourself and you’ll find that whether paying for a poke in the arm is at least a waste of money and at worst an insult to your health and body, it may not be worth it — except to the folks making money from it.